White Oak is somewhat harder on the Janka scale than Red Oak (at 1290). White Oak is a widely used wood for flooring, but not to the vast extent of Red Oak. 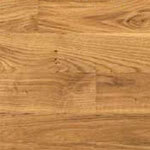 There are many grades of White Oak flooring available. This page is devoted exclusively to Plain-sawn White Oak. Please refer to the Quarter-sawn White Oak flooring properties page for Quartered grades available. Clear grade White Oak flooring is color-sorted for a rich consistent grayish tan color. Clear is the best flooring grade and made of the highest quality (export grade) lumber. Very little color variation is allowed in this grade. Select and Better White Oak flooring is color-sorted to remove extreme color variation, knots, mineral streaks, and surface defects such as cracks. Slightly more color variation will be present than in the Clear grade, but it will still have mostly consistent color. Select and Better White Oak is also referred to as Premium White Oak. #1 Common White Oak flooring is lightly color-sorted to remove the worst color variation. Small dime-sized knots are allowed, as well as mineral streaks. #2 Common White Oak flooring includes all the character found in the wood. Large knots, white sapwood, worm holes, and other surface defects are included in this grade. Other common names are Rustic White Oak, Mill Run White Oak, and Tavern and Cabin Grade White Oak.